OCast almēndrate, OCat amellat MEng almaund mylke, Eng almond milk. The almonds are ground and mixed with a liquid such as water, broth or wine and strained through cloths (draps de lli). Almond milk is of Arab origin, which came to England either through the crusades or from Spain, not Italy or Greece. Apicius has no recipes for it although he has several recipes that include toasted almonds. Almond milk was used extensively in Arab cooking and became most common in Spanish cuisine as it is a nourishing substitute for animal milk, which was prohibited on fish days. The use of almond milk extended throughout Europe as a basic ingredient for blancmange. 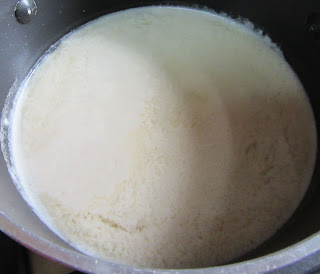 Further, is used as a thickener. Traditionally, in Madrid, almond milk soup served on Christmas Eve. In Malaga today it is the liquid in a white garlic soup, which is served cold. See manjar blanco. 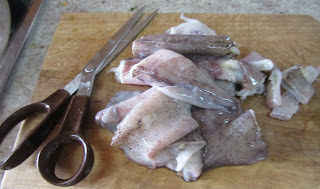 Rinse squid under cold running water, then lightly pat dry between paper towels. Halve tentacles lengthwise and cut bodies (including flaps, if attached) crosswise into 1/3-inch-wide rings. Cook squid in a 5- to 6-quart pot of boiling salted water, uncovered, 40 to 60 seconds. Drain in a colander and immediately transfer to a bowl of ice and cold water to stop cooking. When squid is cool, drain and pat dry. Chop into chunks. Mash almonds and mix them with broth from boiling the eels. Strain them through a cheese cloth. Add spices and garlic to the broth. Bring to a boil and pour over the chopped eels. Serve warm. Calmari or baby squid were used. Also this recipe would richer with the addition of more shell fish such as shrimp, mussels and clams.